From SLC head north on I-15, and take exit 362. 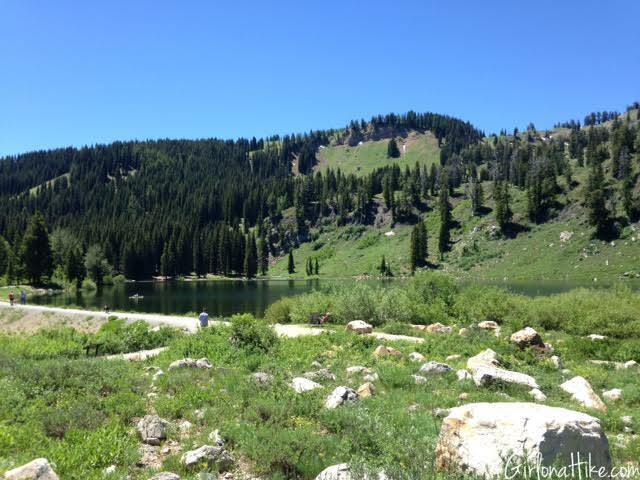 Stay on HWY 89 for 27 miles until you reach Logan, UT. Turn right onto 400 N, and drive another 22 miles. Look for the brown Tony Grove Lake sign. Drive another 7 miles to the large parking lot. There is a vault toilet at the parking lot. Is there a fee for Tony Grove Lake (TGL)? Yes, $6 fee per car, per day. A 7 day pass is $20, and a full summer pass is $35. Can I bring my dog off leash? Yes! They must be leashed in the parking lot, and once off leash must remain under control. Is this a good place for kids? Yes! Scouts come here regularly, and the 1/2 mile Nature Trail is perfect for the little ones. It is not paved, however, so don't plan on bringing a stroller. Can I fish in TGL? Yes, but check fishing regulations & rules prior to arriving. Rainbow and Albino Rainbow Trout are the two common fish in TGL. Can I park here overnight to backpack? Yes. The fee is the same - $6 per day per car. 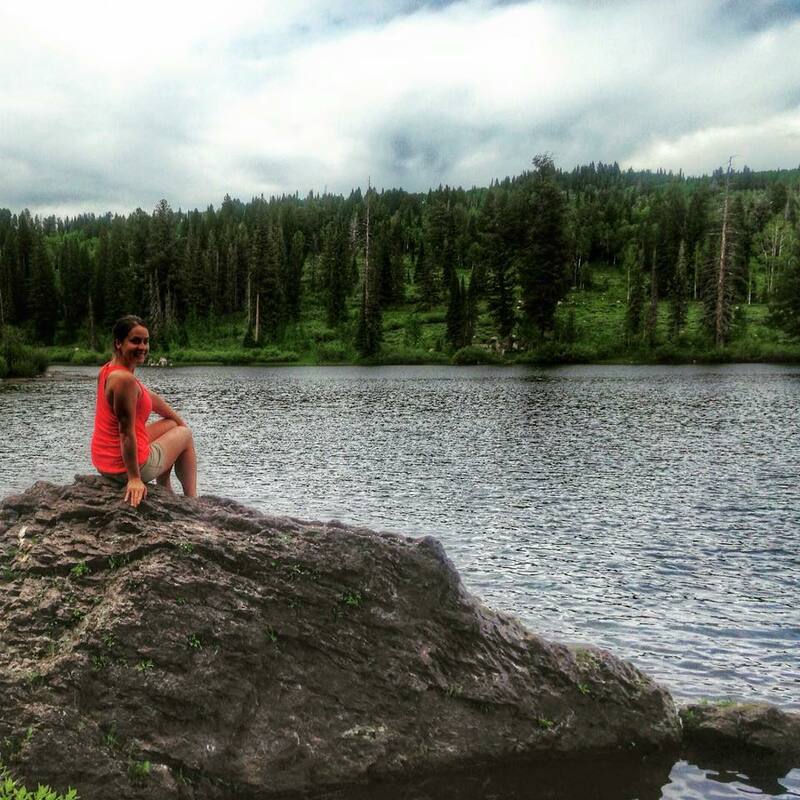 How can I make a camping reservation, and how much is it? 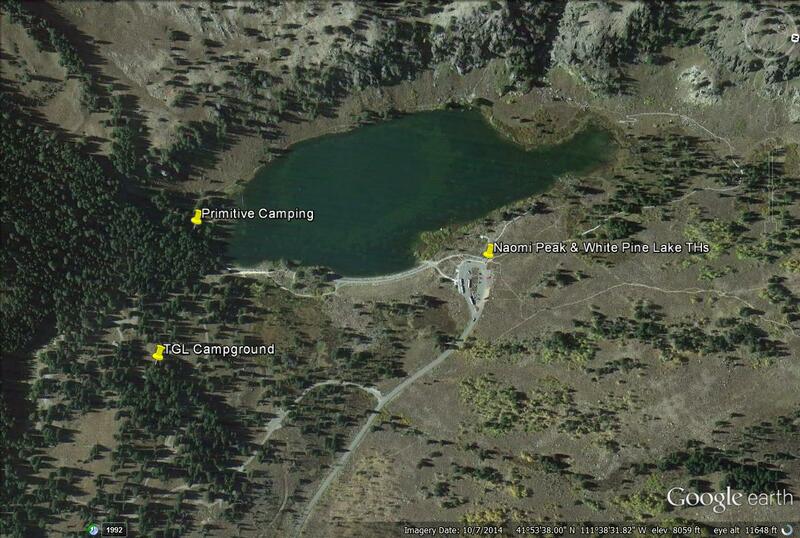 All of the camping info is here, and is managed by the USFS. NO WATER is available. Walking towards TGL from the parking lot. 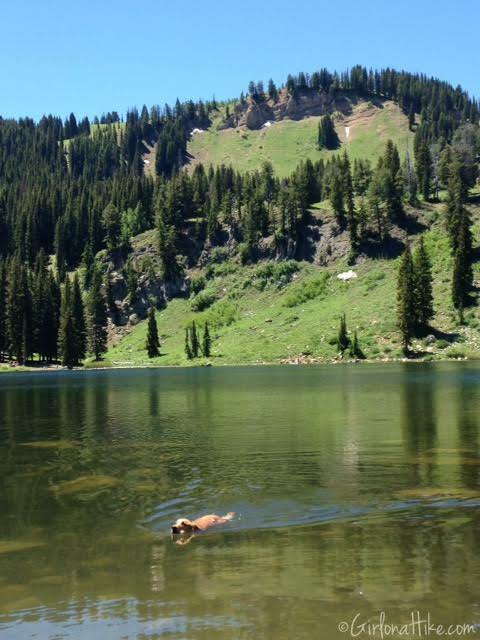 Charlie takes a swim, after our big hike to Naomi Peak. Striking at pose at TGL, on the Nature Trail. 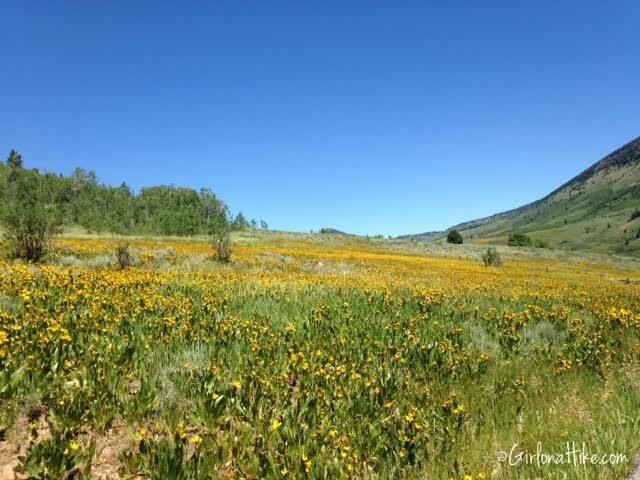 On the drive to TGL in early summer the wildflowers will be blooming in all fields. Just before reaching TGL, you will see a small brown sign for Rick's Spring with a pull out on the left (West) side of the road. 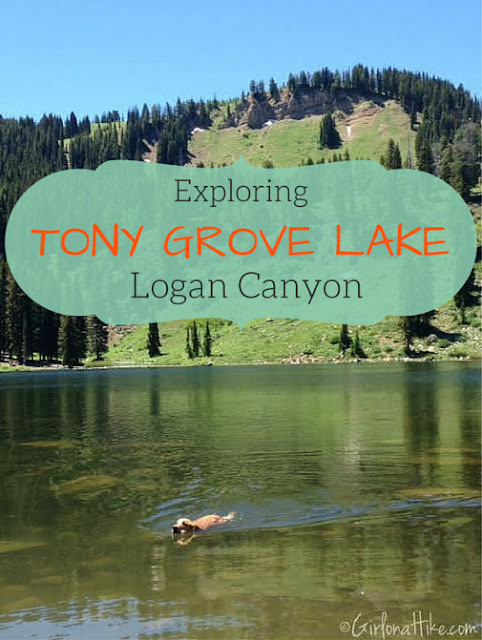 If you are into geology or natural springs, it's a worthy quick stop. 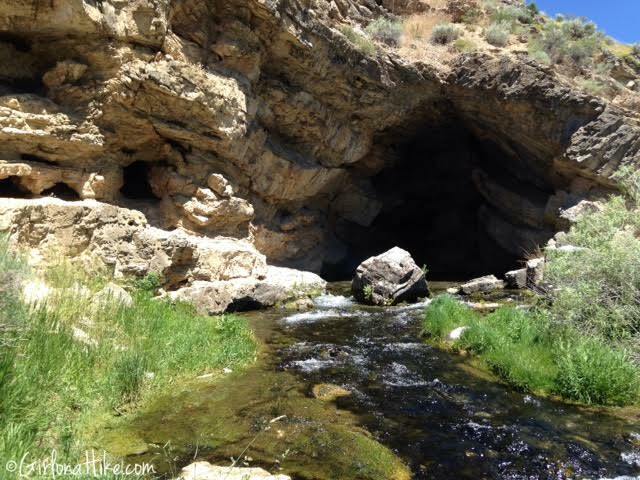 Rick's Spring is a karst spring (underground drainage system) that flows from a cave in Logan Canyon. Pressure from earthquakes have caused the rock to fold and fracture exposing weak points. Over time, water flowing through these points eroded through the limestone creating a path from the river and other inflows at high elevation to flow out of a separate spring. 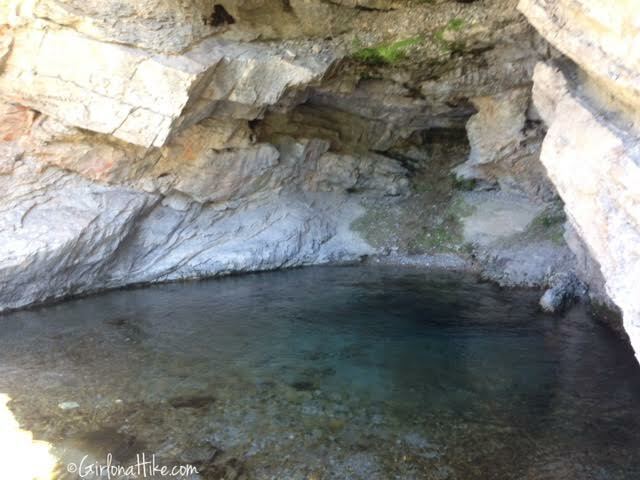 There are two caves at Rick's Spring - an above water cave extends into the rock about 25 ft, and the 2nd is an extensive network of both wet and dry passages that is only accessible by cave diving. Crossing over the bridge to the cave. Since the discovery of this water source in 1859 from Thomas E. Ricks (hence the name of the spring), people visiting the spring often drank from it, bringing home jugs and barrels of the "fresh water spring". They assumed it was from an artesian source. However, once those people became sick with Giardia, they soon realized it was not pure water. In 1972, a severe winter froze the river, jamming it in some areas causing water to fill upstream. Later that summer dye tracing was used in the Logan River and the dye was found in Rick's Spring, confirming the water source of the spring. More dye tracing found that several minor streams, located as far as 5 miles away, and 2600 ft higher in elevation, and it was found that Tony Grove Lake also contributed to the spring. 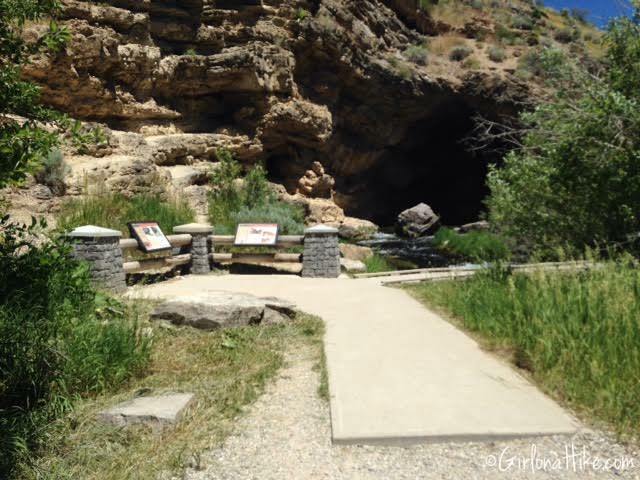 Although it's fun to bring the kids along to check out this spring and learn the geology and history, be very careful that children and dogs to not drink from here nor swim in the spring. Symptoms of Giardia may include watery diarrhea, alternating with greasy stools, as well as fatigue, camps, and belching of gas. Map of the TGL area.